I was a big fan of Dan Millman’s work back in the late 1980’s and early 1990’s, especially his most popular book, Way of The Peaceful Warrior. I was glad to see this quote from Dan on Facebook, posted by the folks at Fellowship of Reconciliation. There is no path to Love. Easy enough to say. So much harder to actually live. Episcopal Café pointed me to a blog by Leesha Faulkner of the Lubbock Avalanche-Journal (of all places!). There has been plenty of press about the “princess syndrome” in today’s young girls, and as one who, as I have said before, was raised by feminists in the 1970’s at Pitzer College, I think this is a marvelous idea. Somehow, though, I think that Mattel is not likely to buy into this. One Faith, One Hope, One Lord, Charles Wesley Singers — 2009 Youth Tour to New England. Courtesy of Unapologetically Episcopalian. Perhaps you’re familiar with the game Word Whomp. 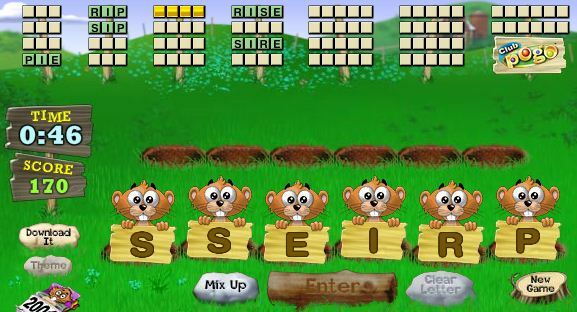 A group of cartoon gophers present a set of random letters and you click (or in the case of my iPad, tap) on the gophers to create words from the letters available. Recently I was playing and the letters a-l-b were among those displayed. So, of course, good Episcopalian that I am, I entered “alb,” at which the gophers shook their heads and rejected the word. What? As a practicing Episcopalian I resent that! I would expect the makers of a word game to recognize such a word, even if not in common use by most of the population. Terry and I are headed to the ocean for a couple of days. The plan is to be back with you on Wednesday. Unless, of course, something spurs my blogging instincts while at the coast. One thing I have in common with my dad is that today in my fifties I feel about my job the way he felt when he was in his fifties. That is to say frustrated and aggravated by corporate silliness and stupidity. The difference is that my dad was able to comfortably take early retirement at age 55. I’m on the other side of that milestone and see another nine years of work before retirement is a realistic option. I keep repeating, mantra-like, that I am grateful to be employed in this economy, and I am. I keep telling myself that I can make the conscious choice to simply choose to like what I am doing. That sort of works, some of the time. And I do remember a lot of the time to look at the Buddha when needed. The quotidian reality is that I look forward to my evening time with Terry: newspaper, iPad, and scotch. And the week becomes a race to Friday. Still, it is not as bleak as it sounds, and the truth is that my identity is not defined by my job. I remember Studs Terkel’s elegy to labor, Working, being a big seller in my early B. Dalton days, and I remember a book coming out to counter that: Work: I do it for the Money. I fall into the latter camp. But the reality is that I have a marvelous life with my wife and our four-footed child Tasha, and it is supported by the work I do.